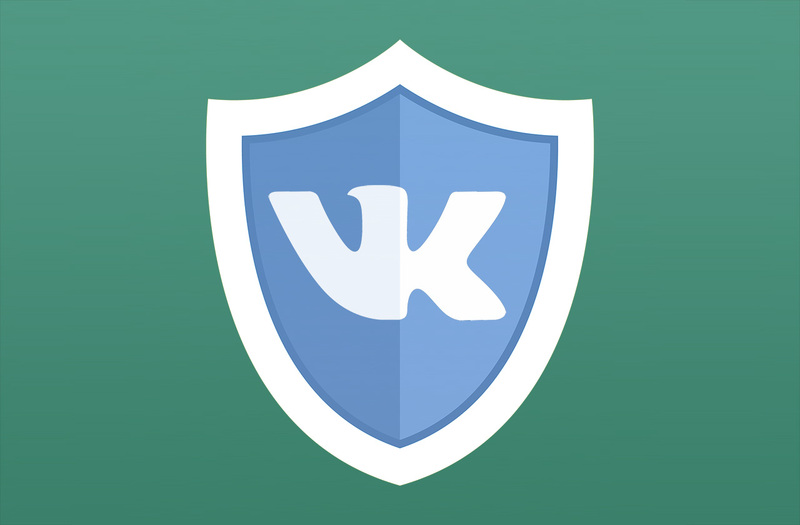 As part of our series looking at privacy, we will take a look at VKontakte (aka VK.com) a Russian social network to showcase how they look at privacy in comparison to Google and Facebook. Social networks are a desirable piece of cake for fraudsters and weirdos of all kinds and vk.com is no exception. Criminals come up with many creative ways to steal user’s login credentials: from common hacks and phishing to such exotic methods as setting on Wi-Fi hotspots which collect your social network login data in exchange for ‘free’ Internet. Of course, one can try to restore a compromised account, block spam and ignore suspicious requests from friends who seem to have been hacked. However, sometimes it’s not as easy as it seems. The best way to secure yourself from cybercriminals is to set up the privacy of your account. It’s not that hard, because the VK interface is very user-friendly. Besides, with this post we are going to clear out what you should pay attention to. 1. Let’s start with your list of friends. If you have a lot of them — more than a hundred — you’d better subdivide them into several categories. This would help you and your friends set up what kind of content can be seen by every particular person. It’s a good idea to make a separate list for all artists, fitness coaches, Internet shops and other commercial accounts. SMM managers of these types of pages don’t need to browse through the photos of your children, do they? 2. Open the My settings –> Privacy tab. Here you can choose, which content will be hidden from the public view (basically, you can hide anything, from posts and photos to groups and notes). Pay attention to the Certain lists of friends setting, which is available in the drop-down window. Now you see, why we’ve asked you to make a separate category for all commercial accounts! The thing is that the owners of these pages are usually the first to send spam and invite users to join different groups. They promote goods via you friend list and thereby bother your real friends! It’s much better to restrict access to your friends list for all people in your commercial list. 3. When you upload photos to VK, you can tag where the shot has been taken. Using these tags the social network makes a map of your travels. We recommend you to restrict access to said map. Otherwise it can be used, for example, by burglars who track when people are away from home. They often monitor social networks and geolocation tags to choose the best time to break into a house. 4. With the help of a special link, which can be found below the Privacy tab, you can check how other people see your profile. If you follow this link, another option will be available: to check how a particular person sees your page. For this you’ll need to enter a friend’s name or a link to a user’s profile. Have a look – it’s very interesting. 5. Your profile photo is always public. The only way to hide it from a certain user is to ban them completely. You can do it in the Blacklist tab. 6. When you decline someone’s friend request, this person becomes your follower – he/she is still able to see all of your public updates. The same is true for former friends. So if you want to break a link with somebody fully and completely, don’t just unfriend them but also add them to the Blacklist. 7. Look through the settings given in the “Security” tab. Be sure to turn on two-step authentication. This measure will highly improve security of your profile. 8. 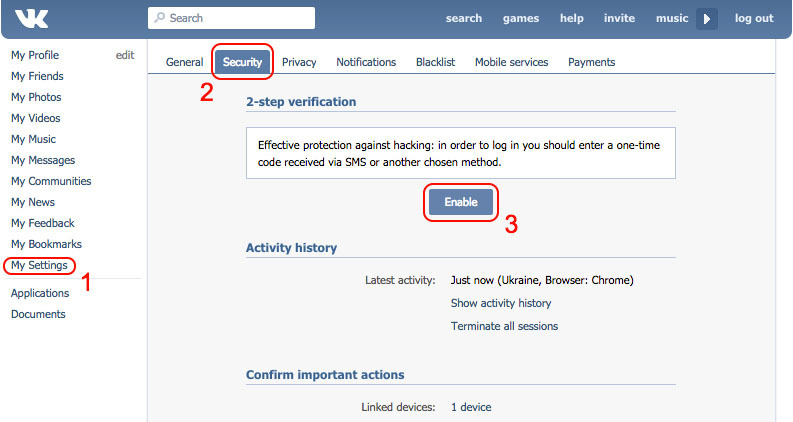 VK tracks time, locations and devices from which your profile has been recently accessed. If you’ve used the social network in an Internet cafe, from your friend’s PC or if you’ve lost a phone with an active VK app, you should use the “Terminate all sessions” button. This measure will not let strangers to look through your messages or steal your account completely. After that you’ll see the Encryption settings. 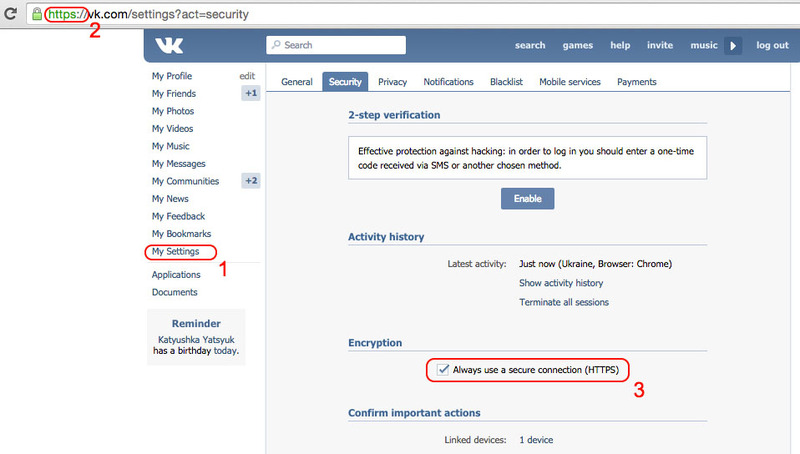 Now you can check the “Always use a secure connection (HTTPS)” option and save changes. We highly recommend you turn this setting on, especially if you often use free Wi-Fi in cafes, hotels and on the streets. Be vigilant and don’t forget about privacy settings. Remember: by setting up security of your account you protect both yourself and the whole contact list of yours as well.